MICHAEL VAIN was born on April 2 in Baltimore, Maryland, and was raised primarily by his grandparents, Michael and Gladys Kradz. Showing an active imagination and artistic drive at an early age, Michael found solace in drawing, painting, and other creative mediums. In creating works of art, he found both enjoyment and purpose. 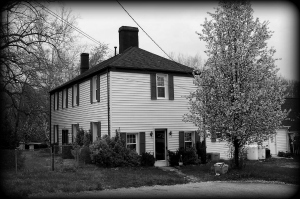 When he was six years old, his grandparents relocated to an 18th century colonial home located in Elkridge, Maryland, where they would live until he was fifteen. Michael and his brother helped to renovate the house in their spare time, which helped instill Michael with a strong work ethic, as well as an appreciation for history and craftsmanship. 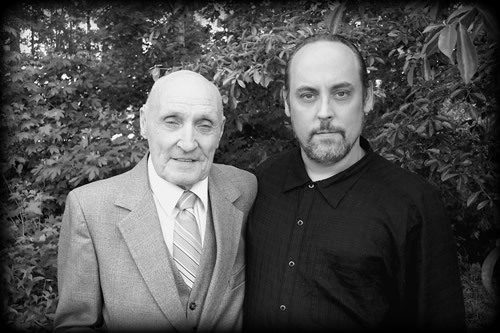 His grandfather, a lieutenant in law enforcement and a pioneer in the field of forensic criminalistics, would often involve Michael in his work, including having him prepare materials related to his work in voice stress analysis. His grandfather's sense of justice and intent over the letter of the law became cemented in Michael's conscience, and is the founding structure for his moral framework. 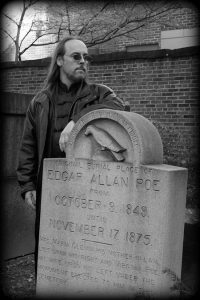 Growing up in such an environment provided a perfect atmosphere in which to explore the darker avenues of imagination, and would become a major influence behind his writing and his art. He began to take an interest in studying unusual and unexplained phenomena, and began to read classic works by Jules Verne, H.G. Wells, Arthur Conan Doyle, and Edgar Rice Burroughs. From there, he moved on to horror, fantasy, and science fiction works such as Dracula, The Lord of the Rings, and 2001 A Space Odyssey. It was during this period that he first began to contemplate writing as a hobby and possible career. Michael's grandfather later retired from the police department, and began working for Dektor Counterintelligence, Inc., as their senior instructor and voice-stress analyst, where he would later co-author the book Investigative Proof of the Reliability and Value of the Psychological Stress Evaluator in Science, Medicine, and Law, as well as other articles relating to the science of voice stress detection and analysis. It appeared that Michael would also pursue a career in law enforcement, and indeed, his close involvement in his grandfather's work made it seem as if he was destined to work in criminal forensics. 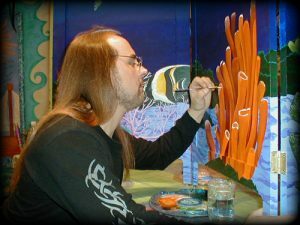 Michael's creative drive proved too strong, however, and he began to specialize in English and Art in High School, with the goal of pursuing a career in graphic arts. He began drawing his own comics, and writing his first short stories. It was also during this time that he first developed an interest in martial arts, an interest that led to a lifetime devotion to traditional martial disciplines. More information about these arts can be found on the Martial Arts page. By his early twenties, Michael found himself a single parent with two children, and found he would need to wear many hats in his role as father and provider. This meant taking whatever jobs he could find, and the struggle to provide for his chidren put his goals for writing on hold. It was not until several years later that he began writing in earnest, drawing upon his childhood in Elkridge as a frame of reference. 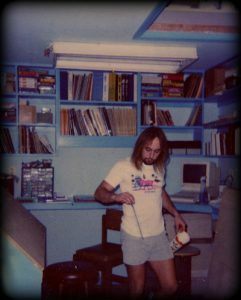 This creative turn would eventually lead to the desire to become an author, a goal he continues to pursue with passion. 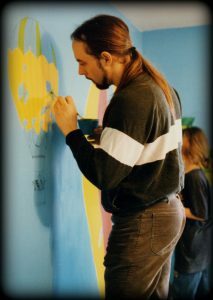 MIchael works on a painted room divider screen. Later, he formed his own art company, Reincarnations, producing unique painted furniture and other artistic creations. 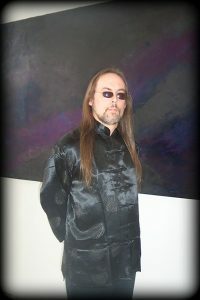 He created the website for their work, Reincarnations.com, which he continues to update as he completes new projects. Today, Michael continues to create works of functional art in many mediums. His painted furniture has been shown in NICHE Award-winning galleries across the country, and been featured in some of the nations's most prestigious juried contemporary craft shows. Photos of his various artworks, covers, and more can be found on the Galleries section. It was while serving as a Gallery director for Artist's Housing in Baltimore Md., that Michael began to assemble the notes and ideas he had been working on for several years into a manuscript. This work later became his first novel, 'Highway Hypnosis'. Michael has since begun work on several other writing projects, and further news will be posted as they are completed.